James G. Mottola is a Vice President of Data Privacy, Investigations and Security for Porzio Compliance Services. Mr. Mottola has more than 25 years of experience in the United States Secret Service including serving as the former Special Agent in charge of the Newark Field Office of the United States Secret Service. 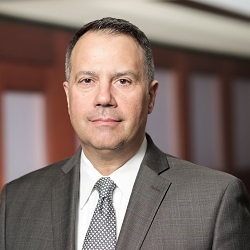 Mr. Mottola leverages his experience to counsel and advise clients on matters of information security, data privacy, physical security, schools safety, internal corporate investigations, incident response management, and other compliance related matters. Jim works with emerging businesses, educational institutions and organizations to provide a strategic perspective, in a wide range of security matters. He advises clients in the areas of risk identification and mitigation to help them prepare, respond and recover from cyber-related events to reduce the likelihood and impact of financial fraud and increase organizational resilience. He has experience leading and managing personnel in both national and international security and investigative matters. Before Porzio, Jim was the Director of Forensic Investigations and Risk Mitigation Services at Sobel & Co. He further developed his unique skill set during his years as a Special Agent in the New York, Phoenix and Frankfurt, Germany office and culminating in his role as the Special Agent in Charge of the Newark Field Office in New Jersey. Jim holds a Certified Protection Professional (CPP) certification from ASIS, a Certified Information Security Manager (CISM) certification offered by ISACA, and a Masters of Management, specialization in Organizational Change.